7.0 Litre Wet Chemical Fire Extinguisher. NZ Certified & Approved. Wet Chemical Extinguishers are for A class and F class cooking oil fires. Wet chemical extinguishers are a must in any commercial kitchen with deep fat fryers. Our extinguishers are a true wet chemical unit with a fast acting solution. Wet Chemical Extinguishers are for A class and F class cooking oil fires. Wet chemical extinguishers are a must in any commercial kitchen with deep fat fryers. Our wet chemical extinguishers are a true wet chemical unit with a fast acting solution. 7 Litre Wet Chemical Fire Extinguishers are recommended for fires involving cooking fats and oils. 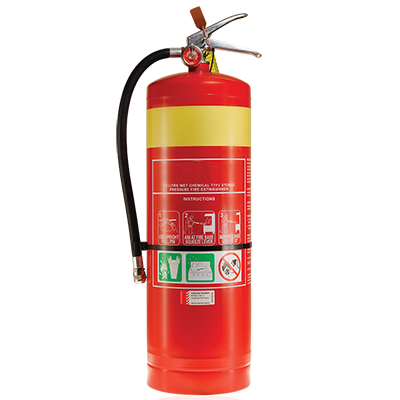 Wet Chemical Fire Extinguishers are suited for Class F fires and also offer a small ‘A’ Class Fire Rating. This is the only type of fire extinguisher that will offer you protection against fires that involve cooking oils and fats. The Wet Chemical fire extinguisher is distinguished by an oatmeal coloured band. Wet chemical fire extinguishers are very effective in fighting fires in kitchen areas. They will extinguish flames quickly, then the cooking oils and fats that were burning will begin to cool. The wet chemical then acts to seal the surface with a soapy type of substance that will prevent the fire from starting again. 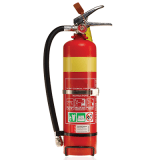 This 2L Wet Chemical fire extinguisher can be used for up to 20 Litres of cooking oil.